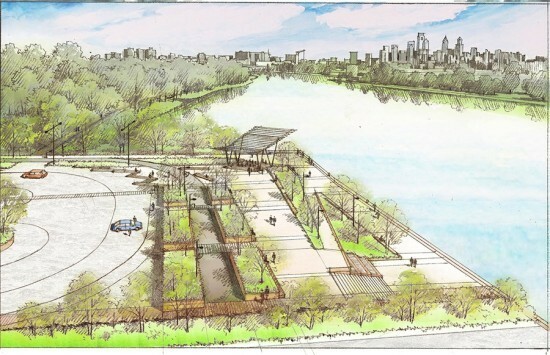 Philadelphia's landscape architecture firm andropogon is redesigning a one mile segment of publicly owned, underused riverbank along the Schuylkill between Grays Ferry Avenue and 58th Street. Industrial development and highway construction has separated residents from the western bank of the riverfront for decades. Andropogon's design goals for Bartram's Mile include integrating the site with existing trails and bike infrastructure, managing stormwater, connecting the riverbank to its urban surroundings, and a design that highlights Bartram’s Garden, the oldest botanic garden in the United States. PlanPhilly's Green2015 plan cites Bartram's Mile as "a major opportunity to convert publicly owned vacant land to public green space before 2015." The project, spearheaded by Philadelphia Parks & Recreation, Schuylkill River Development Corporation (SRDC), and the John Bartram Association (JBA), has been in the works since 2012. While the Green2015 deadline will pass before the greenway is built, stakeholders anticipate the project will be complete by 2016. 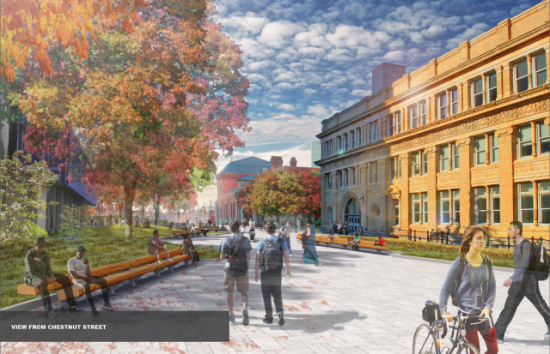 Right now, Bartram's Mile is in its concept and visioning phase. 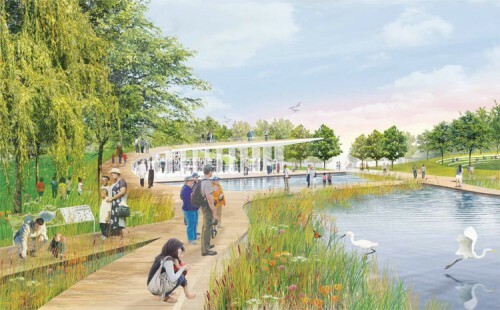 Stakeholders envision bike paths, quiet spaces for tai chi, and landscaping that encourages interaction with the water. When complete, the park will provide another crucial link in the region's trail network that includes the Schuylkill River Trail, and the planned 750 mile Circuit hike and bike trail network (300 of those miles exist today). Consider it a mile-long step in Philadelphia's ongoing architectural renaissance. Local landscape firm Andropogon recently received approval for the plans to re-work a vacant stretch of land beside the western banks of the tidal Schuylkill River. The goal is to convert the plot located between Grays Ferry Avenue and 58th Street into public green space that provides riverfront access and recreational opportunities for local residents. The site is adjacent to Bartram's Garden, the country's oldest botanical garden founded at the house of 18th century botanist and Philadelphian John Bartram, who is also the source of the Bartram's Mile moniker for the future park. The potential for the area was first highlighted in Green 2015, a 2010 study the city commissioned from PennPraxis gauging the feasibility of adding 500 acres of parkland to Philadelphia over a five-year period. The hope is to complete Bartram's Mile before the 2015 deadline established in that plan. 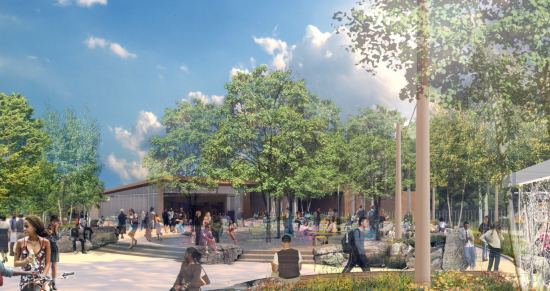 Though some questions linger regarding the specifics of the vision, the Philadelphia Arts Commission gave the project the final go ahead following a presentation by Andropogon's Patty West. The Philadelphia Water Department wanted a 3 million gallon sewer overflow tank. Neighbors wanted maintenance of current community recreational space. Now, landscape architecture firm Andropogon has split the difference for Philadelphia residents concerned with the fate of Lower Venice Island. 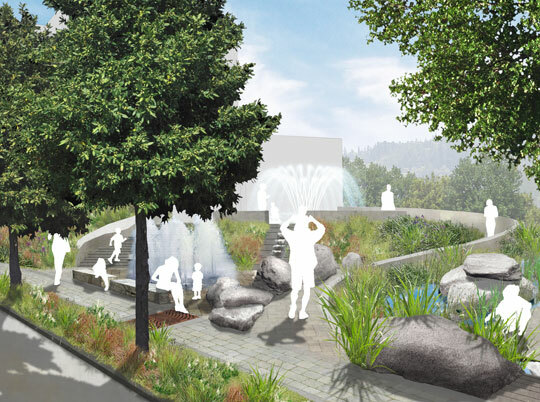 Using high performance landscape design, the firm has envisioned the 5-acre island between the Schuylkill River and the Manayunk Canal as a space for both water maintenance and for community promenade and play. In collaboration with the Philadelphia Water Department and the Manayunk Development Corporation, designs for the stretch of Philadelphia waterfront are “fluid” in their “integration of both uses of the area,” describes the city’s Grid Magazine. 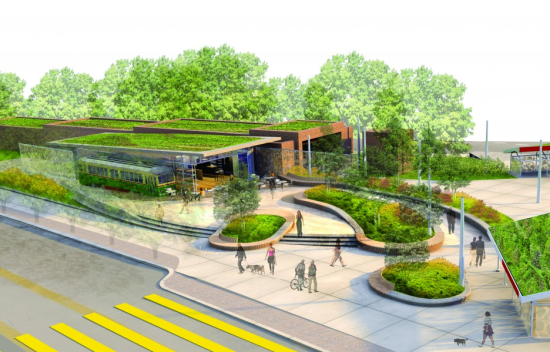 Andropogon renders the land still with an EPA-mandated sewer overflow basin, but combines active and passive landscape design to provide additional function as a public green space. This intelligent planning sees the landscape with its water-locked environment in mind. Solutions for stormwater retention and wastewater overflow are incorporated into the design. Gardens and children’s water features run along a central, lighted pedestrian walkway, which also manages the flow of rainwater. A 250-seat performing arts center by Buell Kratzer Powell is raised 7 feet above the island’s floodway and plans for riverbank restoration further protect the area as a space for community recreation. Transforming a water development project to enhance a public play area, Andropogon’s sustainable landscape design serves both sides of the Venice Island debate.